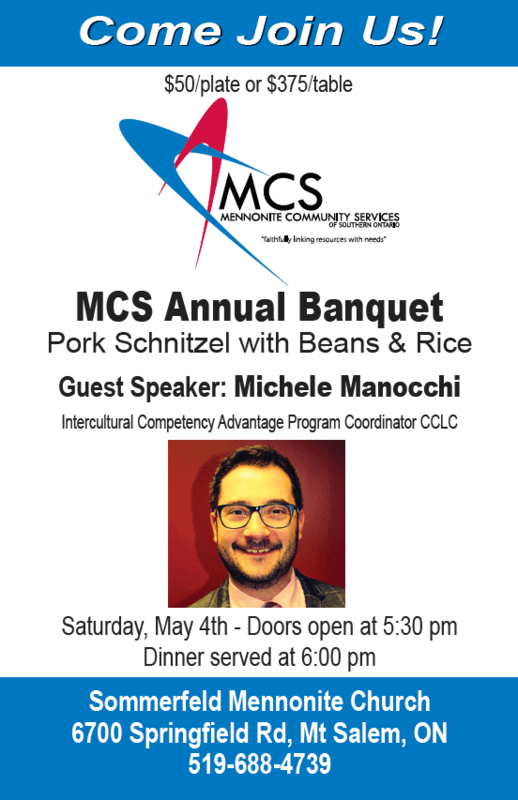 Join us for the MCS Annual Banquet, May 4, 2019! Do you love Adventures in Odyssey? Draw a picture of Whit’s End Ice Cream Parlor and Mr. Whittaker and you could win an Adventures in Odyssey prize! Contest runs from March 22nd, 2019 to April 18th, 2019. One (1) entry per child. Drawing should be an image of Whit’s End Ice Cream Parlor and can include characters such as Mr. Whittaker, Connie, or Eugene but does not necessarily need to. Contestants must be between the ages of 7 and 13 years old. Contestants will be separated into two age categories: 7-9 year olds and 10-13 year olds. Three (3) winners will be chosen from each category. Winners will be determined by a panel of judges on the combined criteria of creativeness, skill, and effort. All winners will be announced on Friday, April 26th, 2019. Prizes are an Adventures in Odyssey NIrV Bible or an Adventures in Odyssey Trial by Fire Audiobook. Each winner will receive only one (1) prize. Prizes will be selected by the winners on a first come-first serve basis. All prizes must be picked up and will not be mailed out. 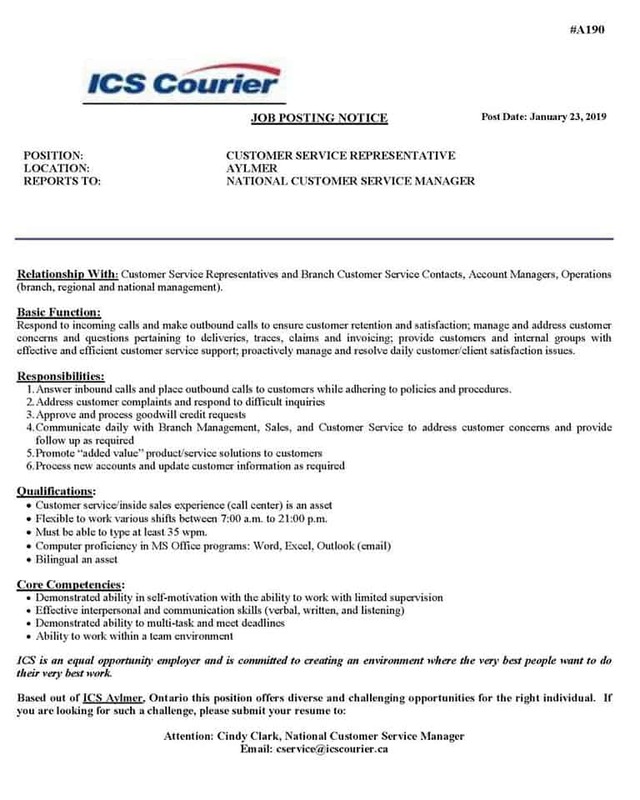 A Customer Service Representative is needed in Aylmer, ON at ICS Courier. 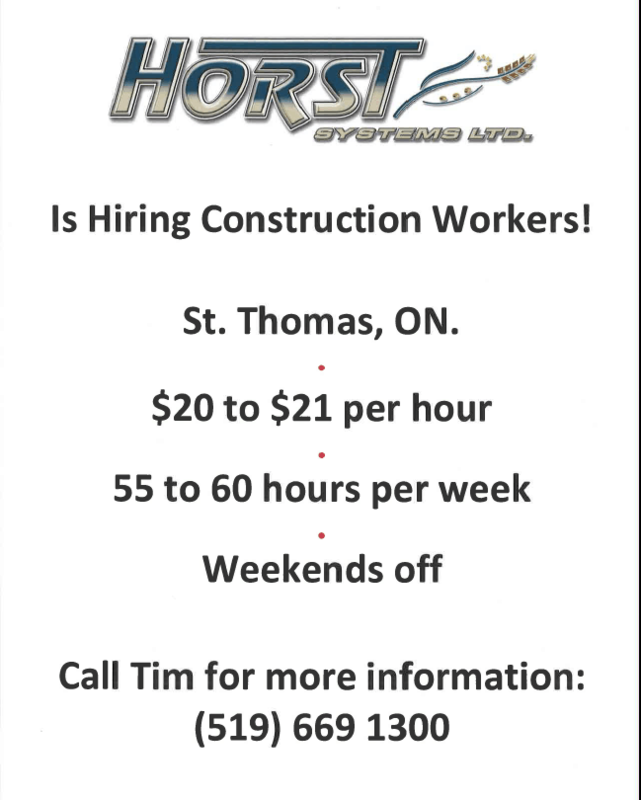 See job posting below for details on the job and how to apply. 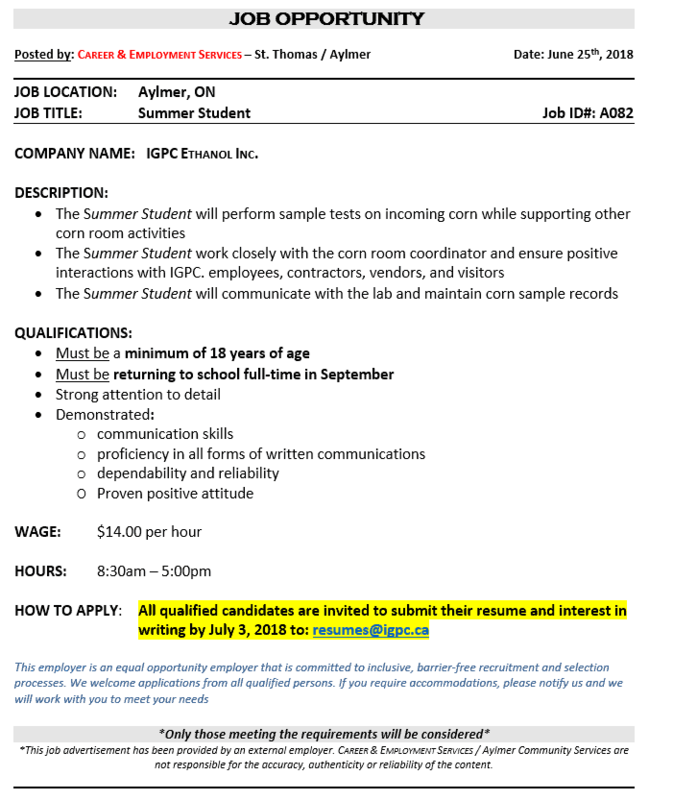 Contact our Employment Services, 25 Centre St., Aylmer, ON, 519-765-2082, if you require any assistance with updating your resume or job searching. Some supports and services for employers are available as well. 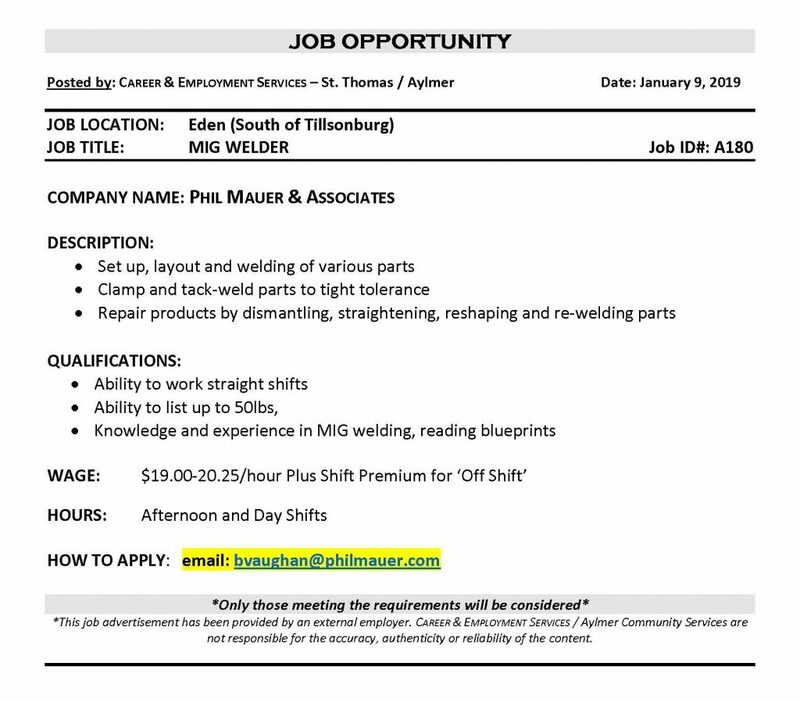 Openings for an Assembler and a MIG Welder at Phil Mauer & Associates in Eden. 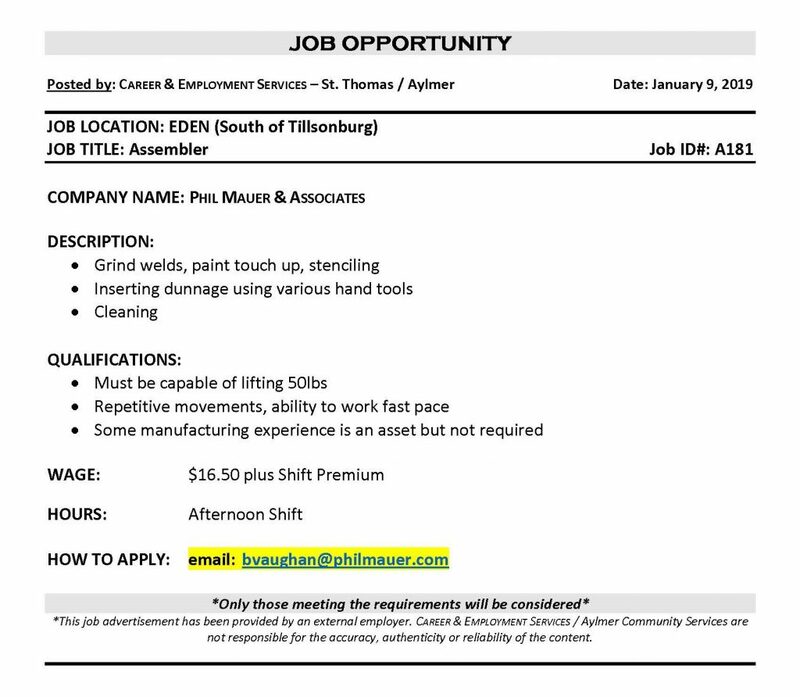 See postings below for job descriptions, requirements, and how to apply. 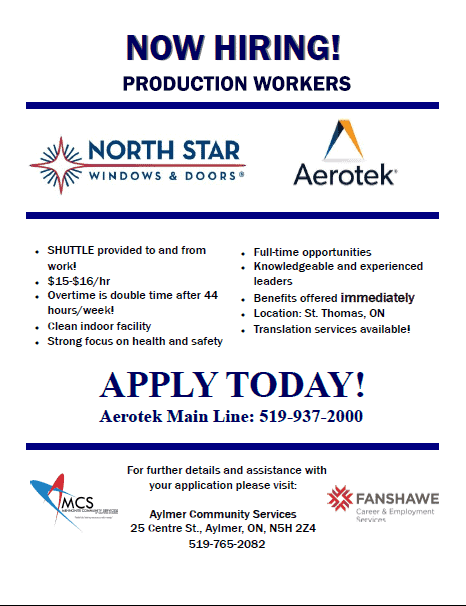 Contact our Employment Services staff at 25 Centre St, Aylmer, ON, or call 519-765-2082, during business hours, Mon – Fri 9am-4:30pm, Tuesdays 9am-6pm, for assistance with your job search or employer supports. The Zacharias’ and Peter & Mary Froese in Concert! Join us on December 1st for an evening of music. Donations will be accepted to cover the expenses. Any additional donations will be used to support Mennonite Community Services, the Peace Square (Friendensplatz) Children’s Home, and our local food bank. 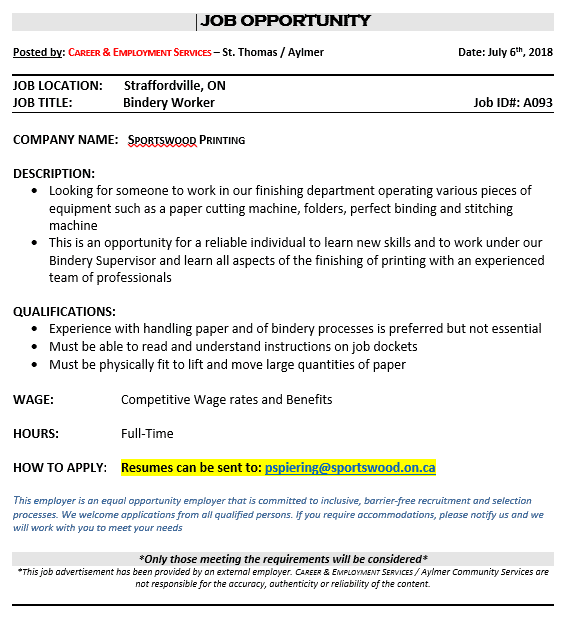 See job posting below for how to apply for the position of Bindery Worker with Sportswood Printing in Straffordville, ON. 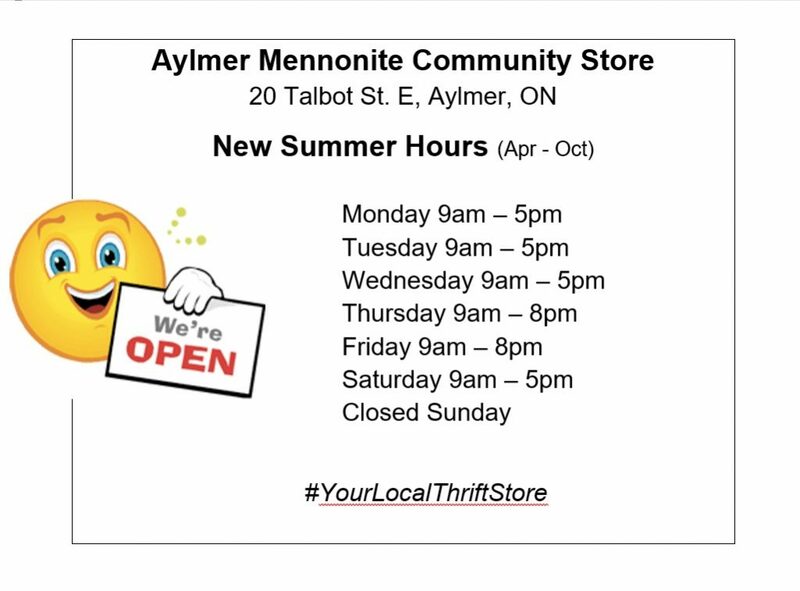 Contact our Employment Services staff at Aylmer Community Services, 25 Centre St., 519-765-2082 for help with your job search, updating your resume, or other employment services for job seekers and employers.